Seven years ago, Dave Simmons from Elk Grove Village decided to turn his passion for riding bikes into a non-profit with a mission to get more people on their bikes. Through Friends of Cycling in Elk Grove (FCEG), Dave is determined to see more people riding not only for recreation, but also for transportation – to school, to work, to the grocery store, and beyond. Dave attended our Bike Walk Every Town suburban advocacy skills-building program last fall where we educated local supporters about how to fight for policies that help communities become more walk, bike and transit-friendly. This includes adopting a Complete Streets Policy to ensure that all road users are considered in future projects, and developing an active transportation plan that lays out a vision for a connected network of low-stress bikeways, sidewalks, trails, and access to transit. One of the first steps to building a local movement is connecting with like-minded individuals in the community who also want to see safer, more comfortable transportation options in the neighborhood. Inspired by Active Trans’ Bike Commuter Challenge, FCEG decided to organize a bike pit stop in Busse Woods in 2012 to connect with more residents and encourage bike safety and good trail etiquette. The first bike pit stop was a hit with 100 visitors and it offered FCEG an enjoyable way to meet trail users and connect with them on a personal level. Ever since, FCEG has been growing and organizing this event every summer. Last summer they hosted four pit stops and attracted over 1,300 trail users. They now pass out free bike helmets for adults and children, offer helmet fittings, fill tires, lube chains, share bike maps and trail safety tips, provide bike safety mechanic checks, and offer refreshments such as lemonade and tasty treats from Jarosch Bakery. Interestingly, when FCEG first started organizing the pit stops, they initially faced some resistance from the Forest Preserve and other potential partners. People were skeptical and didn’t quite understand the community benefits. Advocacy is about building relationships, and FCEG now works closely with the Forest Preserve District of Cook County as well as the Forest Preserve Police to organize each year’s events. For example, the police have been providing free adult bike helmets since 2015. In addition to the bike pit stops, FCEG also offers free bike racks to businesses and organizations in the Village and is currently working with the Forest Preserve to have a permanent bike pump installed in Busse Woods. These initiatives are funded by proceeds from their annual Busse Woods Night Ride through the forest preserve. This year’s Night Ride & Paddle takes place on Saturday, August 25. Dave would love to see the bike pit stop idea and other initiatives expanded to forest preserves and communities across the region. Not only do these types of events provide an opportunity to share bicycle and trail safety tips and create a sense of community, they also offer a great way to build up local support for better biking and walking options and policies. The Village of Elk Grove, for example, adopted a Bike Plan in 2015, and FCEG works with the Village to encourage the implementation of the plan. As public support for biking grows in Elk Grove Village, we hope to see implementation of this plan prioritized by the Village to make biking a safe and comfortable option for people of all ages and abilities. 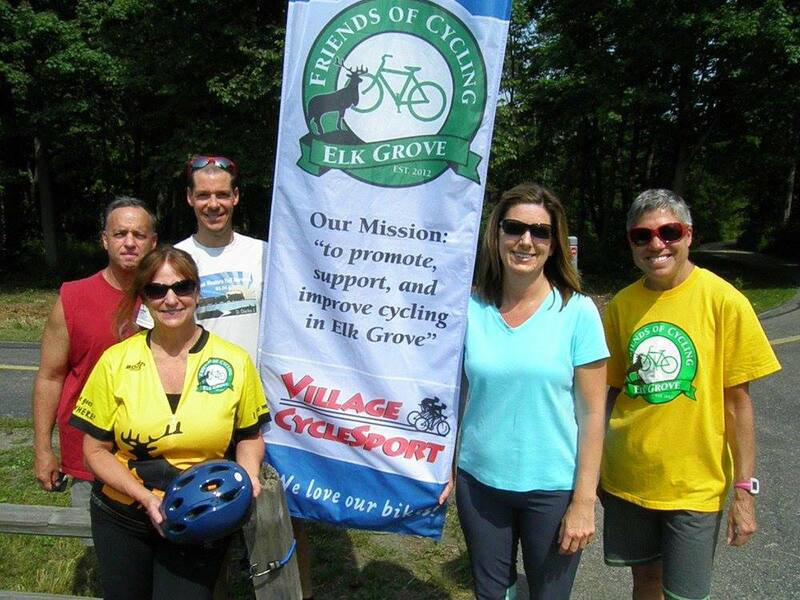 Visit the Friends of Cycling in Elk Grove’s website for updates about their upcoming gatherings, pit stops, bike valets, volunteer opportunities, and casual group rides. If you’d like to inspire others in your community to walk and bike more and advocate for better walking, biking, or transit, visit our Bike Walk Every Town page or contact Advocacy Manager Maggie Melin at maggie@activetrans.org or 312-216-0475 with any questions.